View of Charlotte Sound in New Zealand, John Cleveley, 1788, British Museum. 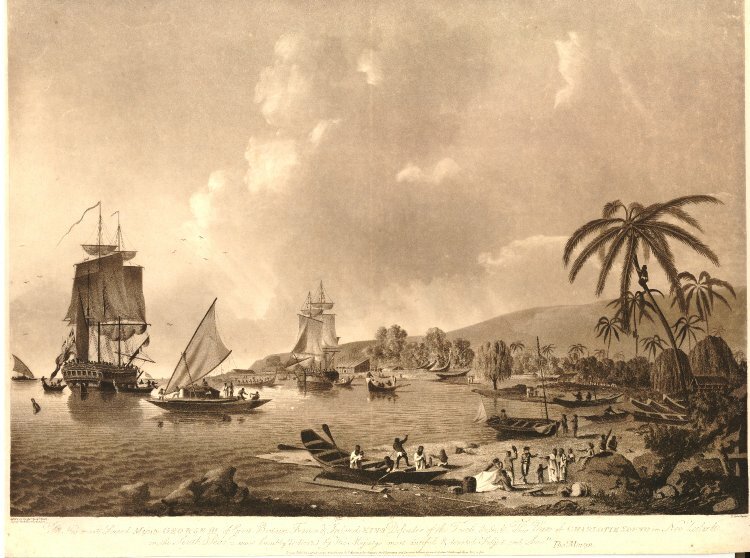 Part of the Cleveley series "Views of the South Seas," this print carries across the sight of New Zealand to an audience newly aware of the riches that awaited the British empire in the Pacific. 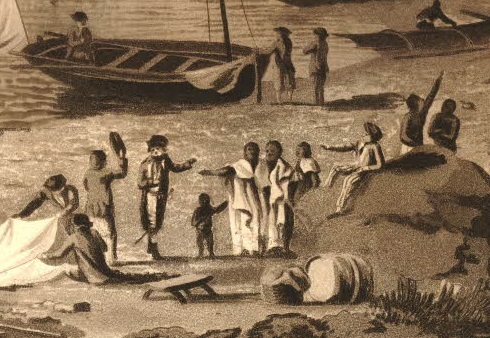 These were lands first brought to the attention of the British by Captain Cook on his famous voyages around the world. With the American Revolutionary War concluded, and the French Revolutionary Wars yet to come, the Royal Navy and the British people could take come time to explore, settle, and exploit the Pacific. There is a small party of men ashore. An officer with a sword at his belt gestured toward gathered Maori, and they are all surrounded by jacks. Doffing his round hat to the officer is a sailor in loose fitting trousers that run down to his ankles, and a triple vented jacket that ends above the top of his thigh. Working at a sail to the left of him are two men in the same slop clothes. On the rock to the right of the Maori is a well turned out tar. His round hat has a narrow brim, and a black neckcloth can just be made out over his jacket. His trousers are striped, and stockings plain white. Standing in the background at the bow of a pinnace are a pair of sailors in round hats with short jackets. One wears a pair of plain trousers, the other a pair of petticoat trousers/slops that end at the top of the calf.